SAN FRANCISCO, Calif. — XP Vehicles, Inc.(TM) is an electric powered automotive manufacturer with disruptive, proprietary technologies enabling safe, durable and energy efficient vehicles that markedly exceed the performance of existing commercial vehicles. Congress has appropriated funds through the Consolidated Security, Disaster Assistance, and Continuing Appropriations Act, 2009, for a loan program for which XP Vehicles has unique qualifications under Section 136 of the Energy Independence and Security Act of 2007. 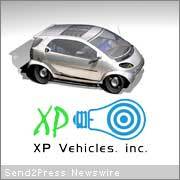 XP Vehicles was one of the first entities accepted by the special Department of Energy (DOE) funding program and is in final review for the loan/grant funding tranche to be completed in December of 2008. XP Vehicles has assembled a team of over 100 companies across the country with the vision to do for electric vehicles what NASA did to put Apollo 11 on the moon. The XP team includes National Laboratories, State Business Offices, and leading edge suppliers across a variety of industries. The goal is for energy independence, a cleaner environment and a safer world, while creating American jobs simply by building this innovative vehicle in an extraordinary manner. XP Vehicles is asking for a loan of less than 1% of the funding of the major Detroit automakers and expects to return this investment to the taxpayer many times over. A massive group of consumers across the country have written in to offer their support and thousands have stated that they expect to purchase a vehicle once they become available. The car body is made of a mix of ballistic and multiplexed membranes, which makes it highly resistant to cuts, dings and dents, making it extremely light and durable while damping all crashes to protect the occupants better than any car on the road. The frame is made of cellulose and polymer with metrics that beat steel and aluminum. The body uses membrane pressure structures similar to those used in the NASA Mars Landers, Homeland Security boats and dashboard air bags already in use in every car made in America, resulting in a light weight, responsive vehicle with very long range that can be made quickly at a very low cost. The manufacturing process resembles garment making more than car making, enabling much lower capital investment. More likely to save your life and protect you and your family from injury due to the intrinsic safety of inflated materials to dampen shock, enabling the vehicle to survive a 30 MPH crash without damage. Even the most extreme body repair work can generally be completed in under an hour. Able to look exactly like a “regular car,” as these materials can be assembled into almost any shape and configuration. Able to provide America with 100% OIL INDEPENDENCE and JOBS! Fueled, in part, by water and energy you can make at home. Longer range because it weighs 1/3 the weight of a traditional hybrid. Fueled by quick, hot-swap, cassettes that enables almost continuous operation; i.e., can be driven across the country without turning it off. Less taxing to the electrical grid and able to operate entirely off the grid as one option. 30% lower part count using lighter, easier to manufacture materials. Higher reliability with fewer parts that can go wrong. Able to be built in lower cost factories with 70% less floor space and manufacturing equipment, which translates into lower cost, higher quality cars for our customers. Able to return investors money significantly sooner because of a lower factory cost and a lower cost of materials, compared to competitive designs. Lower sales price than any other electric car for the same features. Team XP consists of veterans from both Silicon Valley and the car industry, including pioneers of the American classics as the Ford Mustang and Chevy Corvette and the EV1. Design and Factory facilities will be performed through multiple partners in underutilized facilities across multiple states. http://www.myxpcar.com.